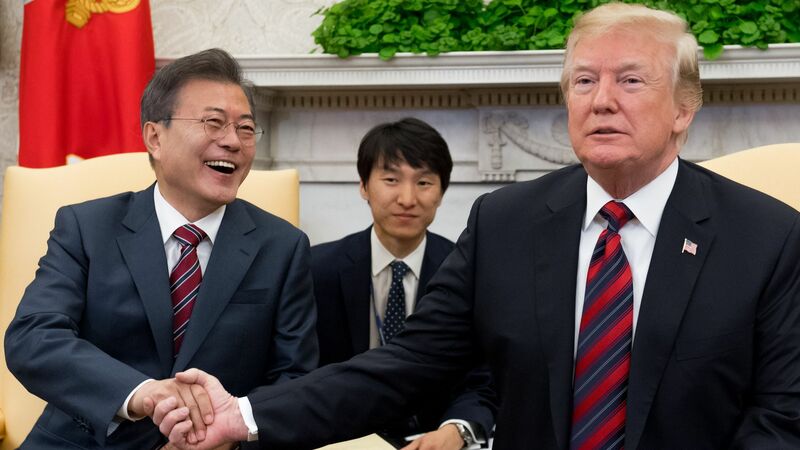 North Korea has been remarkably successful in using its negotiations to divide U.S. alliances in Northeast Asia, raising the stakes for South Korean President Moon Jae-in's White House visit today. The backdrop: After a vibrant North-South summit at Panmunjom in April, Pyongyang has pivoted to shovel abuse onto its neighbor. The North canceled a promised meeting, assailed South Korea’s participation in military exercises, refused to invite South Korean reporters to the closure of its nuclear test site and demanded repatriation of North Koreans. Kim Jong-un is hoping Moon and Trump will blame each other for his bad behavior. Seoul's reaction, and a year of poor management from Washington, have exposed widening fissures in the alliance. Canceling South Korea's participation in military exercises may be read as acquiescence to a threat. Hopefully, today’s summit will see the White House take a decisive stand against the North’s bullying of a U.S. ally and insist on continued inter-Korean progress. President Moon's "peace regime" is essential to managing the risk of war on the peninsula and working toward a tolerable North Korea — both primary American interests. Moon is trying to contain a major threat to the safety of his people; he should not have to think of Trump as another. If Trump doesn't take a stand, Kim Jong-un will see the planned summit not as a starting point for disarmament but as a chance to end the U.S.–South Korea alliance forever.